SHINE THAT #SECONDHANDFIRST. The vintage handbag and shoes remind me of Sheila, so it seems a fitting tribute to Sheila's amazing (and mustard yellow rocking) style to make a shoe shine post for the premiere of Shoe Shine over on her blog. The fun and funky handbag is a #SECONDHANDFIRST score, a 1960s era vintage Enid Collins, quite a collectible name for vintage handbag lovers. 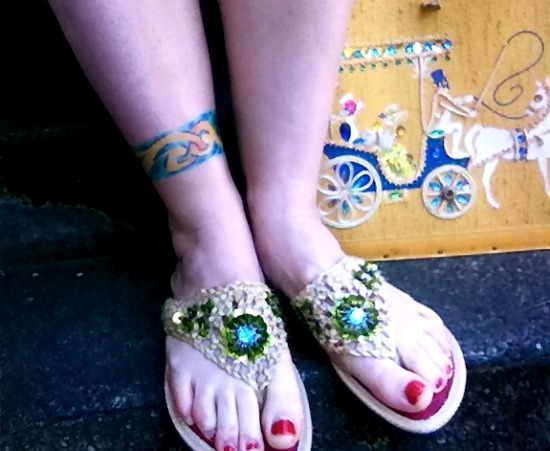 And when I saw it matched the natural twine and sequined Zori flip flops, with a little 60's mother goddess vibe, that cinched the deal- I'm keeping the set for myself! Not sure what dress to style with them- perhaps I'll figure something out before Friday, and share it with you in Friday's SECONDHAND FIRST (now) weekly link-up. Stay posted! 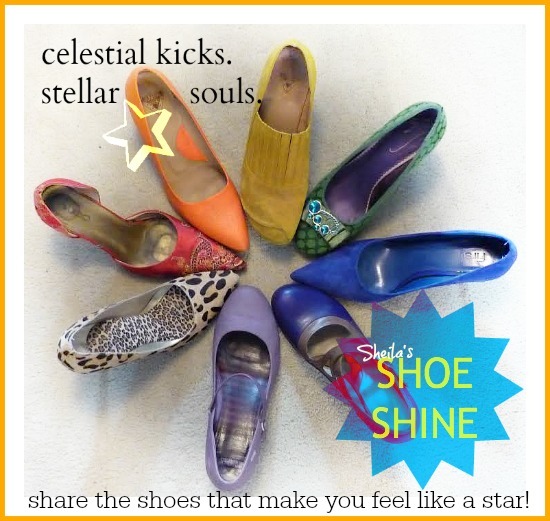 Meanwhile, be sure to visit Sheila's Shoe Shine, link up closes this eve! Enid Collins bags are fantastic! Love your sparkly shoes too. AHhhh, that purse!! Major bag envy here!! I found a Caro Nan not too long ago and was pretty pleased with myself :) Like you, I had to keep it. They don't pop up in thrifts that often. I love your blingy tootsies and that bag. Whew, I also made your Shoe Shine link-up. I don't know that bag brand, yikes. I seem to have fallen off the bag wagon with my tool boxes, but as bags go, that's a winner for sure. I love all the embellishment and the shiny shiny! I've never heard of that bag designer, but will keep an eye out. Thank you so much for the link-ups! What a beautiful bag! The shoes pair with it perfectly. Looking forward to Friday's Second Hand First! 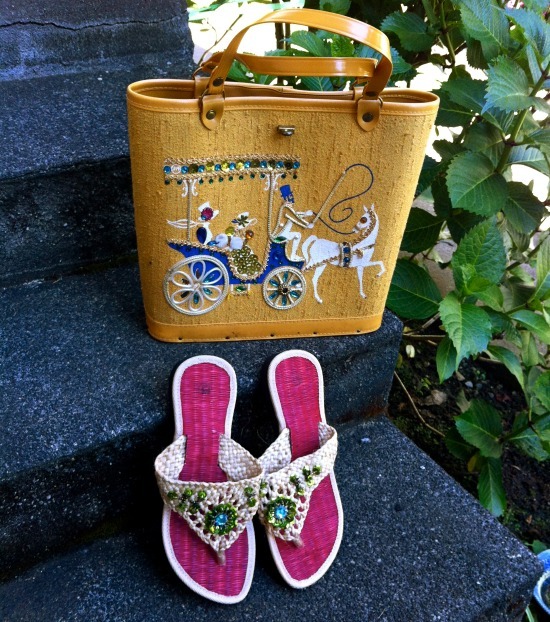 What a gorgeous bag! I love the sequins and the wheels and the whole thing. 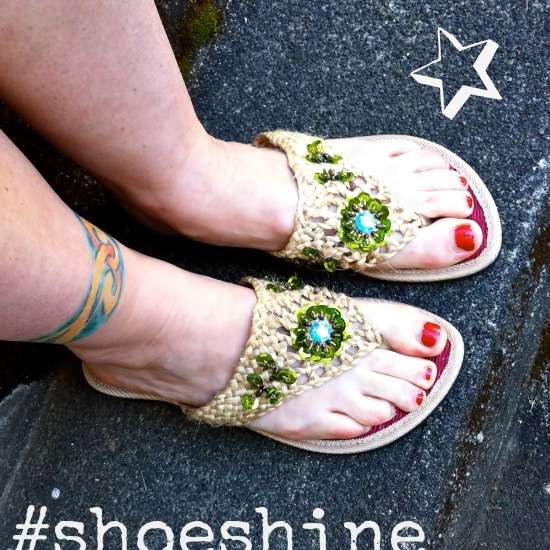 And the blingy shoes - perfect for the good weather we're having. I'll be singing Shiny Happy People today!